Casella CEL are pleased to announce the arrival of an additional model in the Apex Personal Sampling Pump range. The Apex Lite has the full specification of the normal rechargeable versions* but with extra operational and cost advantages offered by running on Alkaline cells. * Apex Lite is designed for use in non-intrinsically safe areas only. ** New AA Alkaline batteries with 25mm GFA filter @ 2l/min. The Apex Lite is an ideal instrument for the Industrial Hygiene and Health & Safety Professionals. Traditional personal air sampling pumps operate from rechargeable cells. These require a charging system and pre sampling charge time with an undesirable cost impact when used infrequently. 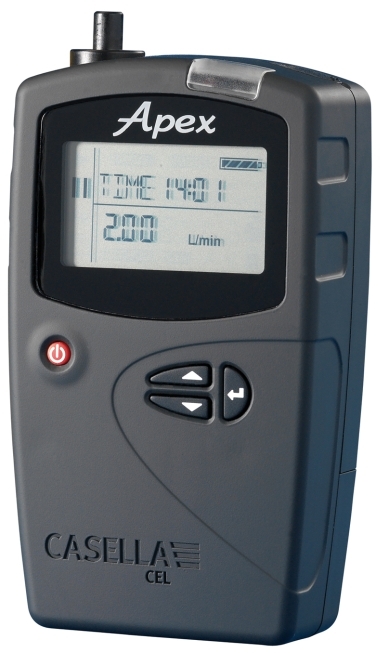 The Apex Lite is ideally suited to occasional or emergency standby sampling applications. Longer run times may be achieved due to the higher capacities offered from some Alkaline cells. Fit batteries and you're ready to go! Users can also source their own rechargeable AA Nickel metal Hydride cells to use with the unit, reducing the cost of consumable dry cells. Alternatively the Apex Lite can be easily converted to use the convenient Casella drop-in charger system. Two models are available, the Apex Standard or Pro. The Pro version offers enhanced programmability and data-logging functions. Data can be downloaded via the IR interface for the generation of comprehensive reports using Pump Manager software. 182073B: Single NimH rechargeable battery pack. Casella Measurement is now known just as Casella.